Ever get red-hot angry at your child for no reason, or out of proportion to the incident that provoked it? Have you wondered why this happens? The way we were parented has a profound impact on us – it’s pretty easy to ‘fall into’ parenting the way you were parented yourself unless you specifically examine your relationship with your parent(s) and how it impacts the way you parent your own child. This can be great if you have a positive relationship with your parents, but for those of us with less-than-amazing relationships with our parents, trauma can impact more of our parenting that we might like. Join me for a conversation with Dr. Rebecca Babcock-Fenerci from Stonehill College in Massachusetts, who researches the cognitive and interpersonal consequences of child maltreatment, with the goal of understanding factors that can increase risk for or protect against the transmission of abuse and neglect from parents to their children. Even if you were not abused or neglected as a child, you may find that aspects of the way you were parented have left you with unresolved trauma that you could pass on to your child if it remains unaddressed. Dr. Fenerci helps us to examine some of the ways we can recognize the impact of this trauma on ourselves, and reduce the possibility that we will transmit it to our child. Auerhahn, N.C., & Laub, D. (1998). Intergenerational memory of the Holocaust. In Y. Danieli (Ed. ), International handbook of multigenerational legacies of trauma (pp.21-41). New York, NY: Plenum. Babcock, R.L., & DePrince, A.P. (2013). Factors contributing to ongoing intimate partner abuse: Childhood betrayal trauma and dependence on one’s perpetrator. Journal of Interpersonal Violence 28(7), 1385-1402. Berthelot, N., Ensink, K., Bernazzani, O., Normandin, L., Fonagy, P., & Luyten, P. (2015). Intergenerational transmission of attachment in abused and neglected mothers: The role of trauma-specific reflective functioning. Infant Mental Health Journal 36(2), 200-212. Cross, D., Vance, L.A., Kim, Y.J., Ruchard, A.L., Fox, N., Jovanovic, T., & Bradley, B. (2017). Trauma exposure, PTSD, and parenting in a community sample of low-income, predominantly African American mothers and children. Psychological Trauma: Theory, Research, Practice, and Policy. Psychological Trauma 10(3), 327-335. Dias, B.G., & Ressler, K.J. (2014). Parental olfactory experience influences behavior and neural structure in subsequent generations. Nature Neuroscience 17, 89-96. Fenerci, R.L.B., & DePrince, A.P. (2018). Intergenerational transmission of trauma: Maternal trauma-related cognitions and toddler symptoms. Child Maltreatment 23(2), 126-136. Fenerci, R.L.B. & DePrince, A.P. (2016). Intergenerational transmission of trauma-related distress: Maternal betrayal trauma, parenting attitudes, and behaviors. Journal of Aggression, Maltreatment & Trauma 25(4), 382-399. Kellerman, N.P.F. (2013). Epigentic transmission of Holocaust trauma: Can nightmares be inherited? Israel Journal of Psychiatry and Related Sciences 50(1), 33-39. Nagata, D.K. (1998). Intergenerational effects of the Japanese American internment. In Y. Danieli (Ed. ), International handbook of multigenerational legacies of trauma (pp.125-139). New York, NY: Plenum. Oliver, J.E. (1993). Intergenerational transmission of child abuse: Rates, research, and clinical implications. American Journal of Psychiatry 150, 1315-1324. Riva, M.A. (2017). Epigenetic signatures of early life adversities in animal models: A role for psychopathology vulnerability. European Psychiatry 415, S29. Yehuda, R., Daskalakis, N.P., Bierer, L.M., Bader, H.N., Klengel, T., Holsboer, F., & Binder, E.B. (2016). Holocaust exposure induced intergenerational effects on FKBP5 methylation. Biological Psychiatry 80, 372-380. Jen: 00:37 Hello and welcome to today’s episode of Your Parenting Mojo. Today we’re going to discuss a topic that I first learned about through a piece that I heard on NPR a few months ago, which is called Intergenerational Trauma. The piece described a Vietnamese woman whose parents had escaped Vietnam during the war. Her mother had had to leave one of her daughters behind and her father’s first wife and son died because their boat sank when they tried to follow him to the US. Her parents didn’t talk much about their experiences, but she remembers clearly how incredibly angry they were when she was young. She went onto say that she learned how to suppress her own anger and frustration so that she wouldn’t set her parents off, but then she now finds herself getting angry over very tiny things just like her parents did when she was young. I had never realized this intergenerational trauma was a ‘thing’ before hearing that piece and I immediately knew that I had to do an episode on it and here with us today to discuss her work on intergenerational trauma resulting from family-based trauma is Rebecca Babcock Fenerci of Stone Hill College in Massachusetts. Professor Fenerci is a licensed clinical psychologist who received her doctoral degree from the University of Denver. Her research focuses on the cognitive and interpersonal consequences of child maltreatment with a goal of understanding factors that can increase risk for or protect against the transmission of abuse and neglect from parents to their children. Specifically, she investigates how trauma related cognition’s, for example, post-trauma appraisals, traumatic memory and interpersonal schemers can affect parenting behavior and/or the parent child relationship amongst survivors of maltreatment. 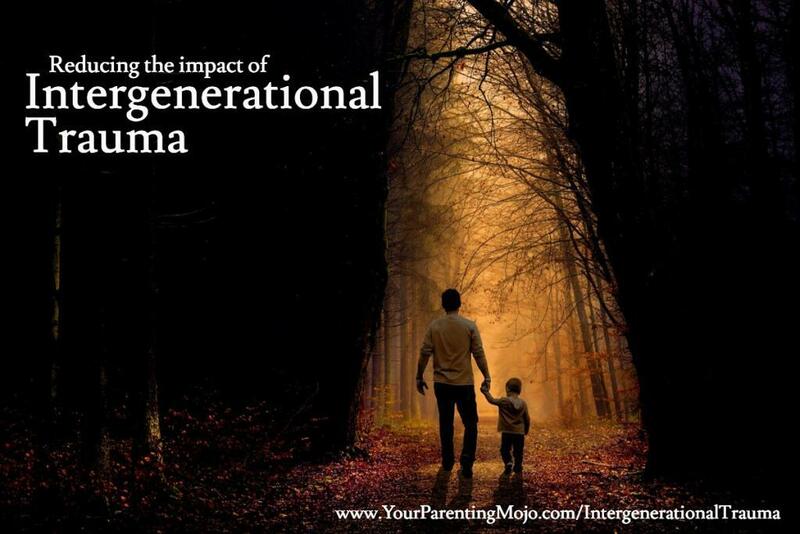 When I was preparing for this episode, I reached out to the listeners who are subscribed to this show on YourParentingMojo.com And who get my newsletter and if you want to get that newsletter, go ahead and subscribe at your parenting Mojo Dot com and I asked them to share their experiences of intergenerational trauma with me so I can ask Dr Fenerci questions that would really help you as much as possible. So we’re going to discuss some of those today as well. Welcome Dr. Fenerci and thanks for working through this with us. Dr. Fenerci: 02:34 Thank you so much for having me. Jen: 02:36 So I wonder if you could just briefly define intergenerational trauma forest please. What is it and how does it affect people? Dr. Fenerci: 02:43 Definitely. So when we think initially about intergenerational trauma, we may think about trauma essentially being perpetuated across generations. So our parents experienced some type of trauma, whether being in a victim of child maltreatment having been involved in a war or some other type of traumatic event, and therefore their child also experiences that same type of traumatic event. And that is what the research is referring to when we’re talking about intergenerational trauma. So often we think about the cycle of violence. So if a parent was abused themselves, they are neglected as a child, their child somehow experiences the same type of abuse or neglect that they experienced. However, intergenerational trauma…also the definition goes above and beyond the increased risk that children have. Parent trauma survivors have for being either maltreated or experiencing trauma themselves. It also talks about the increased risk these children have essentially having the consequences of that trauma such as posttraumatic stress disorder, other mood, behavioral problems, increased risk that these children may have to experience those type of experiences that may not be the trauma itself, but also the consequences of it. And so a few examples of this would be a child whose parent has survived, let’s say, physical abuse growing up. That child may be at risk when we consider this intergenerational trauma if that child also experienced physical abuse. However, if the child is also, was that an increased risk for a certain mood disorders or behavior problems or disrupted attachment, altered cortisol or hypothalamic pituitary adrenal access functioning, that’s our stress-response system. So we see these different types of alterations and transmitted across generations in various different forms. Jen: 04:41 Okay. So it seems to me as though there are two different ways that this trauma can occur in the first place is either trauma that occurs within the family and trauma that occurs outside of the family because of something that somebody else is doing to inflict trauma on a person. And I don’t want to minimize the second one because I actually think it’s so important that we’re going to do another episode on that, but today we’re going to concentrate more on the kind of trauma that originates in families today. So that’s your expertise, right? Dr. Fenerci: 05:10 Yes. That is very much my expertise and that sounds great. Jen: 05:13 Okay, super. So having said that, now my next question talks about the Holocaust. So because that’s where a lot of this research originated is from Holocaust survivors. And so as I was reading through some of these meta-analyses of the literature on intergenerational trauma resulting from the Holocaust and also from children whose fathers were soldiers in the Vietnam War, I was so surprised that the impact even on the immediate survivors was really uneven and in a way the impact on the children was even more uneven. So some survivors are absolutely massively impacted and find it very difficult to function in their daily lives and others seem to come out with barely a scratch, and the same goes for their children. And when I think about the Holocaust, I think about a whole generation of people who have had similar experiences and have had maybe similar impacts on them. But it seems like that’s not the case. Why do you think that is? Jen: 07:28 So parents do for sure. Dr. Fenerci: 07:31 So it’s an interaction between these environmental factors, trauma being one of them, and genetic risk and also personality. Other life events or stressors that may have happened, let’s say before the Holocaust, all that kind of comes into play because humans are…we’re pretty complex creatures, right? So that’s kind of how I view that and I do think that the more chronic or severe the trauma such as the Holocaust, that’s an exceptionally severe, exceptionally chronic, the more likely it is that the trauma is going to have an impact on a large percent of the population that has endured that. So if like everybody has just a bad enough experience. It’s less likely that some people will come out completely untethered, if that makes sense. Jen: 08:18 Yeah. Okay. So then if it’s not correct to say that everyone who has gone through a traumatic event is going to come out of this with trauma, but it may be to more or less extent. And so I’m wondering what are some of the ways that people process that trauma? Dr. Fenerci: 08:33 So there’s a lot of variability in this quite a bit as well. And so in terms of how the brain processes trauma – trauma is processed differently in the brain than kind of regular memories for a few reasons. So first of all, it it our sympathetic nervous system or fight or flight response system is activated. Second of all, our endocrine system that hypothalamic pituitary adrenal or HPA access is activated; floods our body with cortisol and that’s actually adaptive in the moments to help us survive. So however, as a result, especially in the case of family and family trauma or abuse or maltreatment that happens in the family, this system may become over-activated at the time and what results is either can often be a kind of really intense, vivid memory or flashbulb memory. We’re looking at flashbacks, intrusive memories. A lot of the symptoms of PTSD you’ll see through that or what we can see is some forgetting of the trauma itself, whether it’s through, usually through the process of dissociation. Dr. Fenerci: 09:45 So because our limbic system is so activated because our body has trained us, fight, flight, or flee from the US to try to save us from this threat in our environment, our higher level cortex or our frontal lobe, which gives us our thinking and our meaning. Making an organization of our events in our life is shut down in the moment, which is a survival mechanism. However, because a lot of times trauma isn’t talked about, especially trauma in the family, what happens is the survivors never really able to process or make meaning of, or organize these events that could be disorganized or very vivid but distressing in one brain. Jen: 10:29 Yeah. That actually gets to a question the listener emailed over. And so I wonder if we can kind of jump ahead to that a little bit. And so we did an episode on family storytelling recently and we learned about how telling stories as a family can be a really cathartic activity and it also helps the family members bond with each other. But when I put out a call for questions on this, one of my listeners wrote in and I’ll call her Jane just to make the story easier to tell. And she said that her grandfather was very abusive to her grandmother and to their children to the point where he lined them all up at gunpoint and planned to shoot them all and then himself. But Jane’s mom came out of the bathroom right then and yelled for him to stop, and he just dropped the gun and the grandmother snuck all the children out of the house late that night with basically nothing other than the clothes they wore. Jen: 11:18 And the four older girls had a variety of addiction issues throughout their life. Although Jane’s mom has actually been happily married for 40 years and Jane said that none of them had ever had counseling, but every time they would get together as a family, they would rehash all of their memories of the abuse in absolutely excruciating detail. And she says that she grew up very fearful in an otherwise very loving home and just couldn’t really understand why. And so when I was thinking about that, I was thinking about the flip side where I’d read about Japanese Americans virtually never mentioning their experiences in an internment camp during the second world war, which also left scars on their children. So what I’m trying to get at is what are some of the better ways to process trauma and should parents always avoid talking about that? Or can it sometimes hurt the child not to talk to talk about it? Dr. Fenerci: 12:08 Yes, so the way I like to think about this, this oftentimes extremes in life, but in general can be in our behavior, can kind of have, may not be as ideal as somewhere in between, so never talking about the trauma ever has been found to have negative consequences because trauma impacts individuals and has a lot of negative consequences and a lot of ways and if a person is never able to really process that, I would say in a constructive way than they may continue…that could prevent their process of healing. That can allow the trauma to still impact them emotionally in their relationships, in their everyday life. However, there’s also the opposite extreme, which is kind of talking about and telling this trauma to anybody who’s willing to hear it and maybe in what we would say inappropriate circumstances. So trauma has an impact on individuals. Dr. Fenerci: 13:08 Even if it’s just the telling of the trauma itself. That is actually called vicarious traumatization, so we ourselves may not experienced the traumatic event, but if we hear that someone we really loved such as a family member, experienced something horrible and we’re not able to put context into that or really make meaning to understand that that’s going to be upsetting to us because that’s the person we love and we just heard something horrible happen to them and so that’s where I don’t necessarily see it as an all or none type of phenomenon either. I think either extreme kind of have some negative consequences. What I think can be helpful is to potentially it’s up to every parent and survivor, do they choose to share this with their child or not, but I would just be pretty methodical and thoughtful about it and think, okay, what are the pros and cons of saying this to my child? How would I like to express this to them? What could their reaction be to this situation and what is the purpose of telling them; like how could this potentially benefit our family? What could it potentially hurt the family dynamic in some way? And kind of thinking through those things and in more conscientious way maybe with a therapist or another trusted provider in some way I think can be really helpful. Jen: 14:25 Okay. Because yeah, it seems as though it could have both positive and negative impacts. If you your child finds out that something terrible happened to you, that could be very disturbing, but at the same time it could help your child to understand some of the ways that you react in situations that perhaps they don’t see other people react in that same way. So it sort of reminds me of the episode that we did on talking with children about death. Although I think that that’s a little bit different because you sort of don’t have a choice to talk about that. If the person is no longer around, then some kind of explanation is sort of required, whereas this seems to be a bit more optional, but I wonder if an approach of letting the child’s questions lead and responding in a developmentally appropriate way and age appropriate way is the best way to go about it. Rather than trying to flood the child with a complete picture, which may be more than they’re willing to handle, does that ring a bell or make any sense? Dr. Fenerci: 15:18 That makes complete sense. I agree exactly. I think of course when you’re talking to children wanting to be developmentally appropriate and let them kind of feel like they have the autonomy to really guide the conversation is great. Also ensuring that they understand that and I totally agree that in certain circumstances it can really be beneficial and really help the child understand what their parent is going through or has been through and can increase that bond. I think if it’s done in a way that’s kind of thoughtful and like you said, developmentally appropriate for the child. Jen: 15:57 Okay, so going back to where we were originally, we were talking about the ways that people process trauma and so we talked about forgetting aspects of the trauma. I think anger is another way as well that I don’t know if it’s processed, but maybe it’s just expressed and there’s a thing called transference phenomenon. Can you tell us about those things? Dr. Fenerci: 17:12 And in addition transference – that is a classic psychoanalytic or psychodynamic phenomena where essentially it states that unconsciously what we do is transfer some of our unconscious conflicts on to others. However, we were not aware that we’re doing it right. Jen: 17:30 What does that mean in practice? Dr. Fenerci: 17:31 And so often in practice, what psychodynamic therapists will say is that often if the therapist acts, they call it as the blank slate in traditional psychoanalytic therapy and doesn’t really show much of a personality, but then you could show their own personality in some cases, but if there is something about however the therapist is behaving that reminds them of some of these conflicts are early trauma, whatever it may be, that they will then impart those kinds of unconscious feelings are unconscious complex onto that person. Some people will say, oh, that’s that person or that situation triggered me. Right? It’s kind of a common way we refer to it. Dr. Fenerci: 18:17 However, we’re not always fully aware of what was it about that situation or that person that made me feel this way and that’s kind of a way you’ll still kind of call that reenactment where a person may not transfer their feelings or emotions onto a certain situation based on their past, but also may act out certain behaviors or see themselves in certain types of relationships that almost are synonymous with the early trauma in a lot of ways, usually emotionally, so if we had a parent that was very rejecting, for example, and we felt we could never gain their approval and they were always very critical, we wind up finding an intimate partner – a wife or husband that kind of treats us the same way that is called reenacting the trauma on a subconscious level. We’re drawn to that person to be able to kind of be able to work out. Like if I can just get this person to love me that then it’s almost as if everything from the past will feel better. Jen: 19:24 Wow – our brains are strange, aren’t they? Dr. Fenerci: 19:24 Yes, they are. Jen: 19:26 Okay, so when you mentioned anger and triggering, that actually reminds me of another listener question and so a woman named Katie, that’s not her real name, but she responded and during her initial email to me, she said that she was adopted from the USSR as a child and she followed that with an equation. She said, alcoholic plus abusive parents equals orphanage, and she just kind of left it at that. And then we emailed back and forth a bit and she said both of her parents spent time in prison and she said when she became pregnant she worried and researched and worked really hard with medication and therapy to try and undo some of the damage that was done to her and she feels very confident that she has a strong attachment with her son. But just like the Vietnamese woman and the NPR story, she recognizes she has such a quick and strong anger that can really be triggered by simple things like her son repeating things over and over. Jen: 20:14 Or when he does something she repeatedly asked him not to do. She says she just sees red and snaps and has to walk away because she’s afraid that if she doesn’t she’s going to do something she’ll regret. And so since it seems like this is a common reaction, I wonder if we can address Katie’s issues specifically in a way that helps other listeners more broadly. And so her questions to me were firstly, how can she understand what triggers her and why it triggers her and how to become less triggered by those things. And secondly, she’s wondering if there’s any value in revisiting sight of her trauma and going back to Russia and perhaps even seeing her parents or given that these things are now so far in the past, does it make sense to just focus on kind of what’s happening right now? Dr. Fenerci: 20:59 Yeah. So it sounds like she is struggling with some of the core issues or common issues that I think a lot of survivors kind of struggle with is kind of understanding. So sometimes there’s some awareness of what kind of triggers us and our environment and sometimes there isn’t. And often I say, and of course you know I’m a little biased as a clinical psychologist, but therapy really great place, a safe place to be able to kind of really understand some of that because I think it’s through interpersonal interactions and really talking it through with a trusted other that we’re able to kind of really understand. Like what in the present with her son is kind of triggering her why’s this triggering her. Dr. Fenerci: 21:50 But often if she worked with this kind of wanting to contemplate this herself, she could think, okay, what is it about that behavior of my son kind of relates somehow to what I’ve experienced in the past. It could be emotionally, it could be behaviorally, it could be in various different ways because I think the first step is really gaining insight into why does this cause this extreme emotional reaction and then through that insight we’re able to think more consciously to change our behavior in a way that helps us and be able to regulate that emotion in the moment. In terms of revisiting Russia or perhaps her parents. I think that’s something to think through. Again, I think a lot of survivors talk this through in therapy quite a bit at lot of the theme that comes up is as soon as they are kind of coming to grips with this anger and just understanding a little more about really just what’s happened to them in the consequences of that. Dr. Fenerci: 22:50 There’s this desire to approach their perpetrator or their abuser and have that confrontation and break that silence because a lot of survivors are kind of almost forced or coerced or encouraged to remain silent and there’s so much shame in talking about our stories because the stigma in society and because it’s just uncomfortable to talk about in general, so that is not necessarily a straightforward recommendation. I would provide one way or the other. I would think if it could be helpful to her healing in some way, like what would be the purpose of the visit and what would you want to get out of that? A lot of times clients that I’ve worked with has found that it is beneficial. They want to approach the perpetrator. However, being prepared for those type of circumstances like going back to the site of the trauma or whatever it may be is important because it could bring up – it likely will bring up a lot from the past and individuals that have mistreated us in the past may or may not take responsibility for their actions. Jen: 23:55 They may – and thinking back to what we’ve already talked about, it’s possible they might not even remember if they were dealing with their own trauma at the time they might remembet. Dr. Fenerci: 24:04 Right, yes. Jen: 24:04 They were doing the best they could as parents and maybe your childhood wasn’t idyllic, but it was not that bad. Dr. Fenerci: 24:11 Right. And nobody wants to think of themselves as a bad parent. Dr. Fenerci: 24:15 And so our defenses that we may use, whether it’s denial, blaming someone else just interpreting in a different way or literally not having memory of it, the dissociation that can often conflict with the reality that a lot of survivors have. So if going there, wanting that acknowledgement and that validation, this happened to me, I want an apology realizing that may happen, but it also may not happen. And so would you want to go on that visit or see that person regardless of the outcome and what would that mean for you and your healing? Jen: 24:48 Yeah, and I think that’s helpful advice that can be applied in a lot of different situations. So let’s talk about some of your research. I know that you studied trauma that occurs in children as a result of their parents interpersonal traumas. I wonder if you can tell us about some of the effects that you see and what are some of the ways that trauma is experienced by parents can be passed onto their children? Dr. Fenerci: 25:08 Yeah, so I would say in many different ways. We’re still trying to unpack this from an empirical perspective. I think that surprisingly, despite unfortunately the all too common incidence of child abuse and other trauma in our society, we really haven’t understood how this the mechanisms, what I like to call them as the mechanisms. What is it that transmits trauma across generations, so my research try to understand these mechanisms. We see that there’s epigenetic effects again, but I always say maybe it’s just because I’m also a clinician, but you can’t really slice up your genes and just say, I’m going to get rid of this one, so what do we do? What else is going on? What other mechanisms do we have to be able to figure out how this is transmitted? And so a lot of the research thus far, in addition to the very strong genetic research, which I’m not trying to minimize by any means, it’s very important that we understand that. Dr. Fenerci: 26:09 But again, going back to that diaphysis stress model, it’s genes and it’s also environment influencing one another. So what is it about the environmental mechanisms that allow this to be perpetuated and how can we help stop it? And so a lot of the research is focused kind of strictly on psychopathology. So posttraumatic stress disorder, depression in a parent who has survived abuse or neglect or other forms of trauma that plays a role in their parenting behavior or you know, the development of child’s symptoms. However, I’m a personal believer that it’s probably not that that’s not the only thing that we can explain it by. Right? So people are impacted by trauma, not just in the development of symptoms and distress, which obviously play a role, but also in how they think about themselves; how they think about their child’s potentially in how they think about the world, right? Dr. Fenerci: 27:08 So I look at what are called trauma related cognition’s or what are the cognitions are thought processes that result from trauma that may impact the parent and result in certain outcomes in their children. So for example, there’s been some theory which again, this is more theoretical at this point, but it’s a lot of the theoretical basis of my research is the kind of concept that a parent, their child may actually serve as a trauma reminder for them, right? This could be conscious or unconscious and going back to kind of the concept of transference and reenactment. So especially for those that have experienced trauma within the family, we are biologically programmed to attach to our caregivers. So betrayals or mistreatment by our caregivers or other individuals within the family can cause what we would think of this kind of disrupted attachment and that can result in our feelings about how people would treat us, how they won’t treat us. Dr. Fenerci: 28:14 Those form our expectations. How are parents treat us? Very much former expectations for how we should be treated later in life. And so let’s say the trauma results in what we would say disrupted attachment, where the relationship with the parent is kind of less than ideal for a variety of reasons. Now, as a parent, we are on that other side of that relationship. Now we are the attachment figure for a child. So when we’re going, it’s almost reminding us of those early thoughts, memories, feelings, associations that may be associated with abuse, especially if that abuse was perpetrated by a caregiver. And so in that situation, being on the other side of this attachment relationship may result in the act of parenting itself. It can bring up all these…when I was a child, my parents used to treat me like this, all of that, but if the trauma really hasn’t been processed and the survivor’s brain and meaning and context added to that, so we have a greater understanding of our thoughts and emotions that could potentially play out in an unconscious level in our child. Dr. Fenerci: 29:26 There’s also the concept by John Briere, well known psychologist in the field of source attribution errors. So maybe it is not just the child’s serving as a trauma reminder, which could potentially increase a parent’s distress when interacting with their child, but maybe if a survivor does not understand again where this distress is coming from, like with one of your viewers talked about, I don’t really know why this makes me so angry. Some survivors, they’re not realizing, oh, this is the trauma that’s playing out in the parenting context that they may miss attribute that to their child or themselves. It’s the child, my child is causing me to get angry for various reasons. Not realizing that there’s a deeper kind of reason behind that, if that makes sense. For sure. And so what I’ve looked at is disorganized memory, kind of maybe disorganized memory being almost a synonyms, so to speak, of for trauma that hasn’t been processed or made meaning of, especially since a lot of our evidence based treatments involve creating a trauma narrative which attaches emotions and thoughts associated with the trauma to make meaning of it. Dr. Fenerci: 30:36 So maybe if the memory is disorganized, there still hasn’t been this more conscious processing of it. That was significantly related, in the study that I did with mothers who had survived the maltreatment and their toddler age and that was significantly related to more dysfunction in the parent child relationship. Additionally, I’ve looked at different appraisals of trauma that may or may not be associated with symptoms such as feelings of shame, feelings of betrayal, anger that anger again coming up, fear, self-blame, alienation, feeling disconnected from others and how that relates to the parent child relationship in the early development of child symptoms and what I’ve found is that high levels of shame experienced by mothers is related to both more mood and behavior problems and their young children and so that was kind of an interesting finding, but generally more of these negative appraisals in general. Al these kind of negative thoughts and emotions have been associated with particularly more mood problems in early children and so it’s still early on in its process, but this study was really one of the first to kind of look at and go beyond PTSD or depression itself and look at more of these specific thought processes. Jen: 31:58 Yeah. You said a lot there and so I think as parents we get so bogged down in the minutiae of the day to day. We Think, oh, my child is doing X and that is the problem and we’re not even necessarily aware of the firstly our behavior might be contributing to that in some way and secondly that things that we don’t even know about in ourselves that we think are long gone or aren’t even an issue anymore. Or maybe we don’t even acknowledge they were an issue are affecting our relationship with our child. I mean, it almost seems like a wonder that anyone makes it out childhood all. It’s not a secret to listeners on this show that my mom died when I was young and so I grew up in a small community, a fairly stable community and at the time that was probably one of the worst things that happened to the kids in my school. And by the time I got to college I realized my thing was no longer the worst thing. And in fact pretty much everybody at that point had something at least as bad as that, if not worse. And so how can we even think about how this impacts our relationship with our children in a way that allows us to move forward and cope better? Dr. Fenerci: 33:13 Yeah. So as clinical psychologist, I first wanted to disclaim that we study kind of abnormal behavior. What is wrong? There’s also what is resilience? What is productive? And I think that despite all of this, like you said, we do make it out of childhood somehow, that somehow some way and many of us are functioning even despite incredible hardship in our lives. So realizing that we are inherently resilient as human beings is always a positive thing to keep in our minds. However, of course as parents, we want to be able to provide the best for our child. And so I think that a lot of it has to do with, again, it goes back to that processing kind of concept. And so just understanding, especially if there is a moment where when we think back about, Ooh, I feel like I may have overreacted in this situation, or why did this get me so mad? Dr. Fenerci: 34:08 What are we feel like our emotional response or our behavior was more, it’s extreme for the situation that may be a signal to us to think more deeply about that and say, okay, well how would I appraise this situation? Right, so what was going on here? What was my child doing? How was I feeling? And if we think that, okay, maybe we don’t know why we are so emotional, maybe there’s something about it that is especially on an unconscious, more emotional level, reminding us of our past. Something that we feel may still not be unresolved in by resolved. It’s not like I always say like, when are you officially resolved? Right? Dr. Fenerci: 34:51 Is there a moment when: I’m healed, I’m resolved, and so this is an ongoing process in our lives and think anybody’s officially 100 percent healed, just like no one can be the perfect parents. It’s all about doing the best we can and being thoughtful about it. Dr. Fenerci: 35:08 But that being said, just thinking about those moments that may stand out to us or if there’s a change in the pattern of our relationship with our child, where it may be becoming more strange or conflictual for whatever reason, like really thinking that through and thinking about does this remind me of something and what could it be? Right. It may not have been processed fully and just taking some time to think about that because I think if we’re able to gain more insight in the moment and that’ll help us be more mindful in presence with our children. Jen: 35:40 Yeah. Okay. So I, I hadn’t planned on doing this so I’m going to share a personal example and I hadn’t even thought that this would come up. So if my husband’s listening right now, he knows one of my biggest triggers, which is being interrupted. And if I am saying something and he interrupts me, he often interrupted with a question that I’m about to answer and I just absolutely see red and get furious instantly. And it’s about a tiny issue. The one I remember most recently, and it was actually a while ago now, I was about how much postage was required for a particular package and I was explaining I was trying to make his job easier by looking it up before I went to the post office and he kept interrupting me with questions so I absolutely snapped at him. I’ve absolutely done it in front of my daughter when she was younger for sure and looking back on it, I probably has something to do with the fact that my dad was a teacher of special needs kids and so he would teach children who were 16 and who thought like 10 year olds and he would come home and treat his 16 year old 10 year old. Jen: 37:04 And Alvin, my husband just looks at me. And he said “she is you,” so that to me was a very powerful moment and you don’t always get that, you know, the child parroting exactly what it was that you said to give you that insight. But firstly, the process of looking back, which I literally did while it you were talking through, I was listing as well, the idea of why do I get triggered by that? I’ve really never thought about it before because the reason right now is that my husband is interrupting me and that is what is making me angry. Right. So if he just wouldn’t do that. Then I wouldn’t be angry. Dr. Fenerci: 37:45 It was very simple. Jen: 37:46 It is. Yes. And if so, if you’re listening, Alvin, stop interrupting me! So and I’m not going to put you on the spot here and ask you to analyze we right now, but what do you think about what I shared and how that can apply to people who were thinking about these things for themselves. Dr. Fenerci: 38:02 Yeah. So I just love that process right there. Thank you for sharing that. I mean, I think you’ve just provided the viewers with an example of exactly that process of kind of trying to dig a little deeper and gain that insight. You just brought that more unconscious and made it conscious. I mean, I think through that process now, if you’re interacting with your husband again and he interrupts you or if your daughter shows that same propensity for not being interrupted, these thoughts may come to you and so you may think a more of a minute of that. Right? And so maybe that’ll change your behavior. Maybe it won’t, you know. It just depends on how you feel in this situation, but I think that increases our insight into, okay, the next time the situation comes up now I kind of have more of an idea of context of why I’m feeling this emotion so strongly and so I can think through better do I want to respond this way or that way. Dr. Fenerci: 39:05 But now you’re almost armed with more information about where this emotion is coming from. And so I think that can be helpful and I think also important to know kind of from a level of how our brain works, like when we’re really emotional, that is driven by what is called our limbic system, our amygdala, which houses the emotions and our hippocampus, which stores aren’t longterm memories, things along those lines and those are more primitive brain areas and when they’re activated very strongly, they literally shut down our frontal lobe and our cortex, which is where this more thoughtful insight and we’re all that processing is going on. And so to be able to integrate the emotional width, the more thoughtful in the more rational ends can help. I think almost to do the motion and make it a little less intense, if that makes sense. Because literally neurons are firing to set down the higher parts of our brains when we get really upset. Dr. Fenerci: 40:05 Hence the I see red, right? I only see red. However, when we are thinking this through were using those more higher order parts of our brain that humans have developed to hopefully make us these animals that make better decisions. However, that doesn’t always, but we do have the potential to do so and so just realizing that’s kind of just a natural part of I think how we function as human beings, but going through that kind of conscientious process of using our frontal lobes so to speak and thinking this thing through can help us when we’re in that moment that’s driven by these more intense primitive emotions. Jen: 40:47 So it seems as though there were a couple of tools that could be helpful here and I think the first one is one that I rely on in so many situations which is taking a breath. When you see that red, when you feel that anger to just try and take a single breath before responding and that gives you the moment to think, what am I really reacting to here? Is it in proportion to the wrong that is being perpetrated against me right now as my husband interrupts me? Or is it something that’s coming from deep within me? And thus this is not going to be helpful? And so that I think can be an incredibly powerful moment. And I. I wonder if my husband could, could he be the one who says, Jen, do you want to take a breath or do you, and I’m thinking you could. Could we say that to our children if they are having this moment or could they say this to us? If they are five or six and they see us do this and the children have a lot of insight and they see this happening to us, could they say, “Mama, do you want to take a breath?” Or is that something you think would be just completely would send somebody over the edge even more? Dr. Fenerci: 41:57 Well, obviously it depends on the personalities at play. However, in therapy, working with children and their parents, a lot of the times what we do is teach parents to model these relaxation techniques. In the moment I do practice what is called parent-child interaction therapy or PCIT, which provides Invivo coaching bug in the ear and technology where the parent will wear a bug in their ear and I will be speaking to them, helping them coach through various circumstances with their children, primarily children with behavioral or disruptive disorders. And so often in the moment we will coach parents to say, okay, let’s practice taking a breath and through that modeling of essentially and trying to regulate our emotions so we’re able to think things through in the moment the parent is modeling that positive behavior for their children and so they can also suggest that to their children as well. So that is absolutely part of empirically supported treatments for children that also involves their parents. Dr. Fenerci: 43:54 Exactly. But if we’re all able to practice it, I think if everybody practices it in the family and kind of models that. And maybe you say, what do we think – or maybe we can do it together so it’s not, oh, you’re really important. You need to take some deeper. I feel this is starting to get a little escalated. Is it okay if we take a break to both take some deep breaths? Jen: 44:22 So then you’re doing it as a team and it’s not one person’s blaming the other person. Jen: 44:29 Alright. So we’ve touched on a lot of already. I want to ask you, why is it that some parents who have experienced trauma as a child find it difficult to be a parent? And then what specific aspects about parenting is it that’s hard for them? Dr. Fenerci: 44:44 It depends on the parents and their specific experiences and what they may particularly be feeling. So for example, first of all, if a parent has experienced trauma and as a result, they are experiencing a lot of emotions or maybe has dealing with depression or anxiety or PTSD, you know, parenting is hard and full dren depend on us to regulate their emotions initially; they don’t have those abilities, but that’s why they cry when they’re infants, so the parent is there to see them in through their interaction with the parent they learn emotional regulation skills and so as a result of being a surviving trauma, many survivors feel like they can have difficulty with emotion regulation, especially in challenging interpersonal situations with others. It can be very hard, I think to sometimes play that role and not only do you now need to try to remain calm with a toddler that may challenge you or a child that may challenge you in ways that you’ve never seen before because being a parent is challenging, but now you’re serving as that modeled to now promote their emotional regulation. Dr. Fenerci: 45:58 I think that can sometimes be challenging for some survivors. I think also another aspect is really just again, the reminders like we’ve talked about that there can be a sense of loss. If a person grew up and maybe didn’t feel loved the way they deserve to be loved; we all deserve to be loved as children and we don’t feel like we were treated right or loved the way we deserve to and now it’s our responsibility to impart love on our child and even though we may really want to do that, not questioning that desire by any means. I think that can bring up survivors and sense of loss or not having the childhood they feel they deserved or maybe they blame themselves for not having it. I think that brings up a lot of those feelings which may play out and coupled with parenting being challenging in general for every parent and children just having a lot of needs. This is the person that will depend on you as a parent more than anybody else, right? You’re their primary caregivers, so it’s a lot of responsibility. It can touch that. I think some of the loss and a lot of those feelings that may or may not have been kind of processed, but even if they are process there, so it’s not that these things don’t go away, right? So it means that some of the core intense feelings we may have about our own childhood and then in that midst we have to be able to practice trying to cope with our own so we can be there for this other person that needs us so much. Jen: 47:33 Yeah, and you mentioned that the idea that there’s no question that the parent wants to be a loving parent and it reminded me of something that you found in one of your studies where a number of mothers who had experienced childhood trauma reported being loving mothers and loving being mothers, but this was actually associated with lower social emotional wellbeing and their children. What was going on with that? Dr. Fenerci: 47:56 Yeah, that was a very unexpected finding. Dr. Fenerci: 48:00 And I’ll have to make kind of a very pessimistic outlook. Unfortunately, through my work with the child abuse survivors, I do believe there are some people, unfortunately, that in some negative circumstances do you have negative feelings that they’re projecting onto their children? That may be kind of conscious. Those are some of the more horrible stories I’ve heard, but I think the vast majority of parents do want to love their children, but unfortunately there is this kind of negative. I mean just how we see people, that there’s murder and a whole lot of other things in society, right? That we’re like, well, you don’t want to deal with that, so I don’t want to present such rose-colored glasses of this whole thing that you know, in some very severe circumstances that can be the case where there can be individuals intentionally hurting children. That unfortunately does happen. However, that being said, I think there are the majority of survivors, so we look statistically speaking, out of those that have certain parents that have survived from treatments, 75 percent will go on to maltreat their children. So that’s the good news and the 25 percent we can’t necessarily say is that intentional conscious, unconscious, malicious, whatever. So I do think the malicious intent is a minority in this case. So did want to give you that kind of. Yeah, and I apologize. Can you repeat the question? Jen: 49:26 Yes, sure. Yes. It was a bad parent and a mother who says that they love being mothers and then the social emotional wellbeing of the child is actually lower than you would expect. Dr. Fenerci: 49:37 Yes. And so what I would anticipate here, I kind of look at how personality can develop as results of chronic maltreatment and so I kind of view this as this may be not just narcissism per se, but just in that mothers may not have, again, experienced trauma, not all mothers that have experienced trauma, but that may be particularly vulnerable in this case. They’re searching to have their own needs met, if that makes sense. So their needs and their desires to be satisfied in the relationship. I want to be a good mother. This, you know, I’ve had a horrible life, but now I’m going having this child. Now this child is going to love me and now I am going to be fulfilled as a mother. Being a mother is going to make me feel better. I’m going to love my child. My child’s going to love me. Dr. Fenerci: 51:30 If you’re looking for that person that really just needs their needs met, right? Our children come first and we’re putting our needs and our ego, our child is fulfilling our own ego so we have super satisfaction that parenting because it’s meeting our own needs, but are we meeting our child’s needs? So that was kind of my hypothesis about that as kind of a little bit of that, that and that the narcissism that can sometimes come out or just not realizing that we’re putting our needs before our child because we have so much loss there. If that makes sense. Jen: 52:05 Yeah, it does. So I’m wondering as we sort of wrap up here, are there signs that parents can look for I guess either in themselves or in their child that could indicate a potential problem and if a parent sees one of these signs, what should they do? Dr. Fenerci: 52:20 Sure. So I mean I would look at too, I think a lot of the signs of trauma that often come out through things that we would generally be concerned about with our children, right? Oh we think our child all of a sudden kind of gotten a behavior problem happening or there’s a lot of conflict going on are my child feels really down or very anxious and fearful. So some of those things that may or may not be. So we don’t want to blame ourselves as parents – it may or may not have to do with this history. But I think a lot of those kind of general things that are kind of yellow flags that come up when parents become concerned about their children. Those will be the things that. And I think those will be times where, Oh, you may consider bringing your child to therapy, things along those lines. Dr. Fenerci: 53:09 So when those types of things happen, I think that that’s often that may be something else could be going on at play because that that’s also what we generally look at in the research, is mood or behavior problems or discord in the relationship. That’s usually how it’s manifesting in terms of intergenerational trauma and then it’s hard in ourselves…I think sometimes it can be hard, but just giving ourselves a good hard look because mental health in general is so stigmatized in our society in a lot of ways given a good hard look at ourselves and how we’re doing emotionally. Is it that we are struggling with depression or struggling with posttraumatic stress or other things and it’s okay to be struggling with those things. That’s unfortunately a normal response following traumatic events. But if that’s the case, how much may we be experiencing distress and do we think that distress could be impacting our loved ones in some way? Dr. Fenerci: 54:13 So just even just asking ourselves that question I think can be helpful because it can be some of the most heart wrenching things to really think about is that we all want to feel like we’re doing okay. Sometimes it may be that no; maybe I need to reach out and if you don’t get some help or go to therapy and get some services or maybe I need to work on my relationship with my partner and address this thing that we don’t feel comfortable addressing. Right. But I think a lot of times we’ll see those signals. So signals will be there, whether it’s discord in our relationships or just distress in ourselves or something down in our children. I think a lot of that, if we allow ourselves to look at it and admitted it to ourselves, we’re very smart and we know these things. I don’t think it’s so much a mystery. Jen: 55:06 I think the tendency when parents see misbehavior or some other kind of problem with their child is to fix it with the child, that it’s the child’s problem and if we just fix the child, then things will be better. And I think it goes back to what you said, we’re not blaming the parent here or even automatically assuming there’s something else going on, but it might be worth just checking what else is going on in the family dynamic and could something that’s impacting you also be impacting your child. Dr. Fenerci: 55:31 Yeah. Just exploring it. Dr. Fenerci: 55:34 And also normalizing this behavior too, because depending on the age of the child toddler’s tantrums, things along those lines, I think that can vary depending on the child. So taking developments of course into it, because I think a lot of times parents can be very hard on themselves and realizing what is developmentally appropriate and what actually could be more of a concerning problem. Jen: 56:00 All right, well on that note, thank you for doing this research, and kind of embedding yourself in this and it’s, it must be incredibly difficult, but rewarding work. Dr. Fenerci: 56:13 Yes, I would call it that. Jen: 56:14 Yeah. Yeah. And thanks for coming on and sharing your knowledge with us as well. I really appreciate it. Dr. Fenerci: 56:20 Of course. It was such a pleasure. I’m so to have this opportunity to be able to discuss research and some of these issues that you know I think are really important, passionate about with others.